Getting familiar with crime statistics is a great start to making your college experience both a fun and safe one, too. But once you have decided which school is best for you, there is still a set of fundamentals you must follow both on and around your campus to make sure you stay safe. Remember: You are responsible for your own actions. Your choices and behaviors are your own. All the safety measures and stats in the world won’t help you if you’re not making smart personal-safety choices. Read below for some basic guidelines, tips, tricks, ideas, and attitudes to adopt for your entry into your new life. Once you have completed the action items such as doing your drive-by and getting all the crucial numbers into your cell phone, you can then refer back to this game plan from time to time to assess your personal safety on campus as you go through your daily, sometimes crazy, college life. Do not let your photo appear with your dorm name, address, phone number, or any other identifying info in campus directories that are available to the public. It is best to stay “incognito”, especially as a new student, you don’t want to be a target for businesses or organizations wanting to sell something or “take advantage” of the newbie. Only you should decide who knows where you live, eat, and sleep. Participate in all freshmen orientations the school has to offer. It’s a great way to learn the ins and outs of the campus, from how the systems work to quickest routes to class. And you’ll meet a ton of new friends in the process! Whether you’ll be traveling mainly by foot, bicycle, car, or public transit, take some time to get to know your way around. Learn how to get from dorm room to classroom and other parts of campus. Survey it block by block, and familiarize yourself with the immediate surrounding neighborhood, too. Make a mental note of where the blue-light phones—emergency phones that dial directly to security—are located. Make sure to let your parents and/or close friends know what your daily schedule is. Give them a copy of your class schedule and activities along with a list of important phone numbers like your RA, roommate, counselor and any other important contact numbers in case of an emergency. Be sure to program the number of your local campus police into your cell phone, as well as the city police station. Dialing 911 on your cell phone can sometimes direct you to a regional call station miles away. You will have to explain to them exactly where you are, and then dispatch will contact the police agency that is closest to you. Having your local numbers programmed into your phone not only gets you to the agency you need, but also saves time when every second counts. However, 911 is always the best number to call when you are off campus or not in your local city. Get a feel for what’s happening downtown. Lots of Universities have wonderful “College Towns” with great restaurants, coffee houses, etc. But, it still is a town or city . . . be aware of the areas or places that seem to attract the crazy or reckless crowd. Steer clear of those areas on a weekend night when things can get out of control quickly. You don’t want to be pulled into something just by being in the wrong place at the wrong time. No matter where you are, on or off campus, you must always be aware of your surroundings. The more you are familiar with the area the less you become a target for criminals. Remember: Criminals look for the easiest target—that is generally someone who preoccupied, unsure, and generally unaware of who or what is around them. Always walk with confidence, like you know where you are going; that’s what I call the Safety Chick Swagger. Remember: If you are in a new town, it may show. The town is filled with people who are strangers to you, but at the same time, you are very familiar to them. When you and your new roomie go to Wal-Mart or Target for your brand-new matching bedding and stuff, be aware of the people around you; criminals in college towns are on the lookout for the newbies to victimize. Be sure no one is following you when you shop or when you head back to your dorm or apartment. 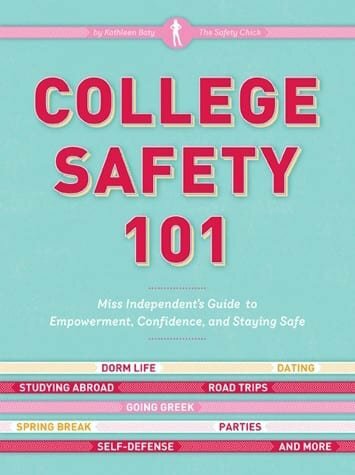 Even though this chapter is about campus safety, I want to emphasize that crime against college students is not just perpetrated by other students and does not happen just on campus. You must remember that no school is a closed school. There are thousands of nonstudents who cruise on and off campus every day and night. Be sure to park in the lots on Campus as opposed to spaces on the side streets or lots downtown. Campus police patrol these areas making things safer. Try to park in a highly trafficked area, not in a dark corner in the back of the garage. As you pull into the garage, scan the area for anything or anyone suspicious. Think ahead—make sure you park in a well-lit area if you plan on coming back to your car after dark. Make sure to lock your car – Do not use a remote to unlock (or start the motor, if you happen to have a remote engine starter) until you are at your car door— you don’t want your attacker or car thief to get to your unlocked door first. If you have to use an isolated parking lot, always arrive when you know other students will be there, both at the beginning and the end of your Better yet, always try to use the good old buddy system for your party—the truth of safety in numbers never gets old. Have your keys ready before you reach your car. Have your cell phone out and ready to use in case of emergency, but wait until you are in a safe location to start chatting with friends. Make sure to have your backpack or purse on your shoulder(s), keeping your hands and arms free—that way, you are ready to react if someone approaches. NEVER leave your keys in the I have watched people leave their car running and door unlocked while they run into a convenience store or post office, thus presenting the perfect opportunity for car thieves! Never leave valuables in plain site-be sure to lock them in the trunk, hide them under the seat, or stash them in the console or glove compartment. Don’t leave any paperwork showing personal information, such as your mail, bills, or residential parking permit, visible on the seat or dashboard—you don’t want to reveal your name, address, or where you live to a criminal by allowing them to read it through your car window. Taking the time to be alert and aware getting from point A to point B is the key. Many crimes have happened to people who were distracted and not paying attention to their surroundings. I have watched countless surveillance videos of purse snatchers, abductors, and car thieves brazenly attacking their victims in parking lots and garages. The common thread was that the victims were completely unaware of who was around them and what was happening until it was too late. So the next time you’re running to the mall for that great shoe sale, remember to take a moment to park safely and be aware of your surroundings going both to and from (hopefully with a few new pairs of cute stilettos) the store. Kathleen Baty, a proud UCLA Alum, is the Founder and CEO of Safety Chick Enterprises, a firm whose mission is to change the way personal safety is embraced nationally. She believes that people do not respond to fear, but rather, by being empowered to make smart safety choices. In 1991, Kathleen, herself the victim of a kidnapping attempt at gun point by an obsessive stalker, teamed up with then California State Senator Ed Royce to pass the nation’s first anti-stalking law (SB2184). In 1997, she and now US Congressman Royce teamed up again to help pass the first Federal Anti-Stalking Law (H.R. 3230). Kathleen is currently working with the Transportation & Safety Administration (TSA) and Homeland Security (DHS) as the Host/Moderator for our country’s new Anti-Terrorism Training and Education Videos, launching in 2017. She is a member of the International Association of Chiefs of Police (IACP), the National Association of Threat Assessment Professionals Conference (ATAP), the American Society of Industrial Security (ASIS) and the High Tech Criminal Investigators Association (HTCIA). Additionally, Kathleen helped create the country’s first stalking course for Police Officer’s Standards and Training (POST).